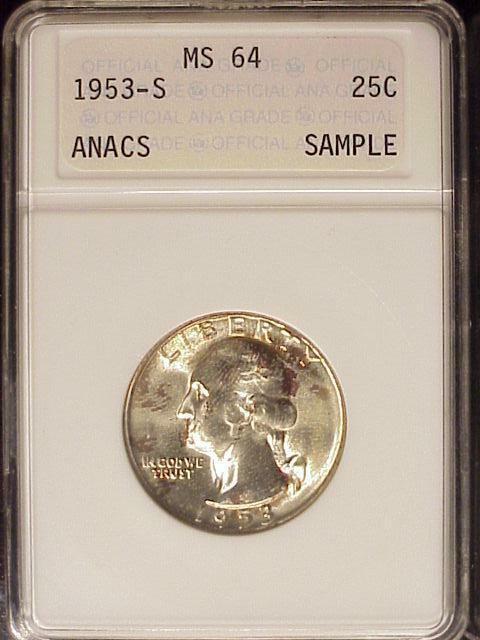 ANACS was the first company to actually grade coins as a business, at first they issued a picture of the coin along with a certificates. Then in 1989 they changed over to the slabed coin, This is a first generation ANACS sample slab. As I am able to get more pictures, I will do my best to insert then in the correct order. A very plain wight on wight is the first holder design for ANACS. 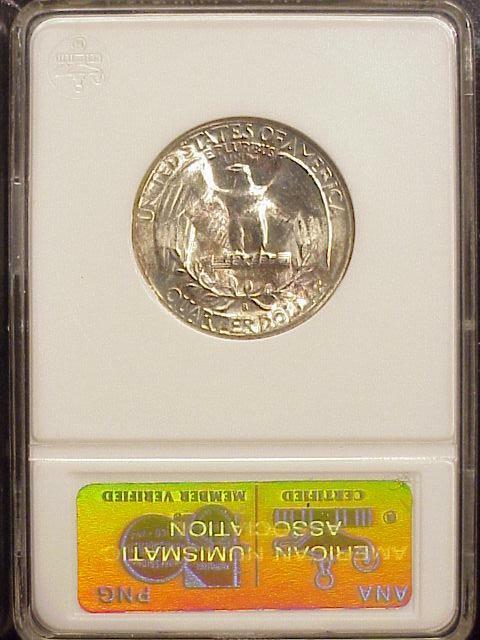 With a 1953-S silver Washington Quarter graded MS 64, this was not a inexpensive coin. Most grading companies started out using the Roosevelt Dime so I was impressed at their choice of coins, to start off the first slabbed coin. 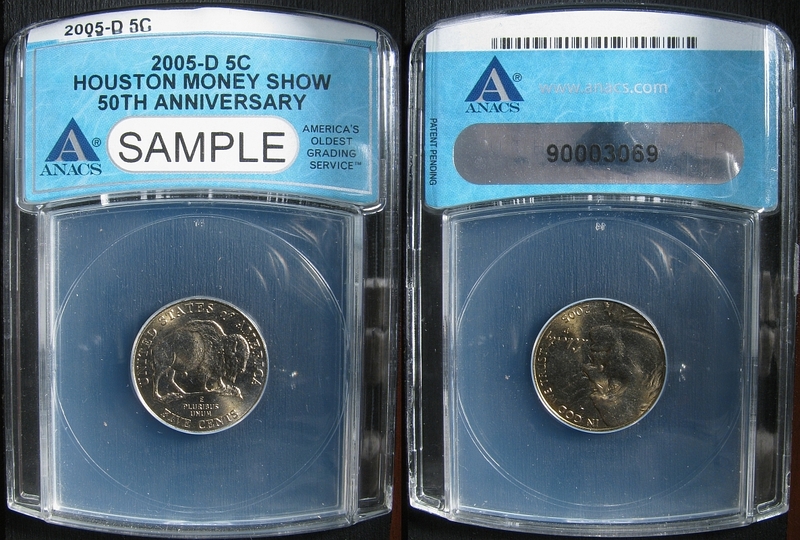 Here we have a sample produced for the Huston Money Show, and its 50th anniversary. 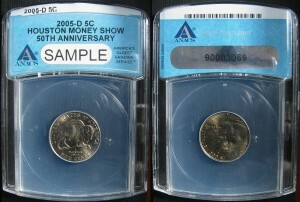 ANACS had just started making samples for shows in 2004 so this sample would still be relatively new slab. 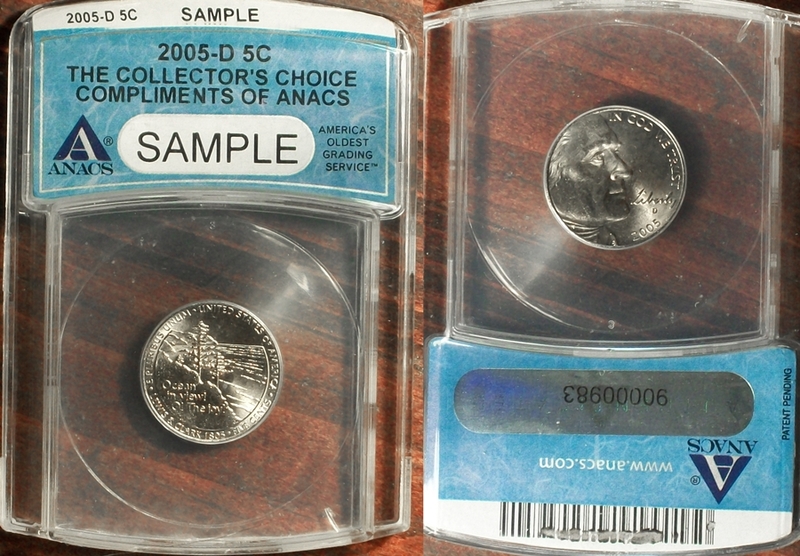 This next sample is one of two with the words “The Collector’s Choice Compliments of ANACS”. 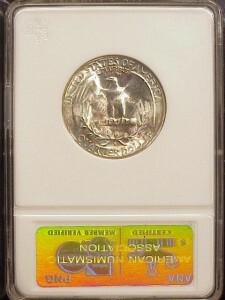 They both have a 2005-D Ocean View coin inside However there was a difference, as the one above had a smaller font than the same sample that was given away at the Denver 2006 show. I found it very interesting that ANACS would produce seven different sample slabs, and six different labels, for their move to Austin Texas in 2006. They gave away all but one of these sample slabs to the public at the ANA Denver show in August 2006. So far I only have one picture out of the seven but in time I hope to have them all. This is how I have broken them down. Three held a 1965 Jamaican 1 Penny coin, one held a 2005 -D Ocean View Nickel one held a 1967 Jamaican 1/2 Penny and one held a 2004-D Texas Quarter. 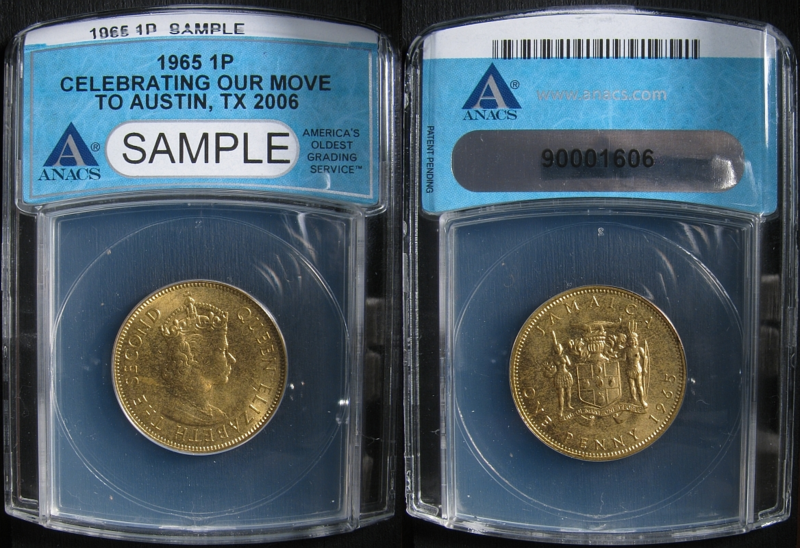 The sample above is the a 1965 Jamaican One Penny sample slab, this was given to the employes of ANACS, when the company moved to Austen Texas in 2006. The third sample read “Celebrating 34 years! Now in Austin texas 2006”,. Only 200 of these sample were produced and handed out at the Denver ANA Pre-show. The fourth sample using the same coin and the same year read “A new day at ANACS! and 2006 Denver”. This sample was produced in larger quantity than the pr show samples. The fifth sample read “Celebrating our move to Austin texas 2006” they were also handed out at the 2006 Denver ANA show. this label was also produced in a small quantity of a few hundred. 1967 1/2 Jamaican Penny and was produced in larger numbers. The seventh sample has the same label as the first sample reading “Celebrating our move to Austin texas 2006” it holds a 2004-D Texas Quarter. Is there an ANACS type between 4 and 5? I have 3 instances where the front of the certificate is 4, but the reverse has the addition of “Coin size is an approximate measurement of either the diameter or the greatest measurement of the item shown, expressed in millimeters.” and a metric ruler. CoinHELP As the name implies, this is a site where coin help is key. With information on all types of coins and a friendly coin form this is the place to go. SmallDollars.com This web site is a comprehensive study of United States small size dollar coins.